Swift 內建功能利用背景工作, 讓 Container to Container 如同鏡像一樣同步所有資料. 不僅僅是自己的Container, 還可以跟其他人Account內的Container相互同步資料. 這個功能也被部分企業用來將資料從舊的Swift Cluster轉移到新的環境上. 如果User request是對object做POST的操作, 操作內容不一定會被同步, 除非object_post_as_copy = true 在 Proxy server 的設定, 目前這個值預設為開啟 true. First of all, you need to know there are two styles for setting container-sync currently. 不論新舊styles, 都有一個重要的前提, 原資料所在的Container Server, 必須要能跟遠端目標Container 的 Proxy Server 透過網路連結的到. 新的做法需要先建立一個設定檔 ( /etc/swift/container-sync-realms.conf )在兩個叢集的"所有"節點. 具體一點來說, 只要會涉及到這個同步過程的所有Proxy Server與Container Server 上面都必須要有這個設定檔案. realm1 的名稱是可以自行定義, 用來配置一組Container-Sync域. 這個新的觀念可以提高Container-Sync功能的安全性還有彈性. Key則是用來做Request驗證的數位簽章. 送出請求的Container-Sync含有這個key, 接收到的 Proxy server 會驗證是否符合他這邊對應的資料, 如果送過來的key. 這個key並不等同于x-sync-key這個header. 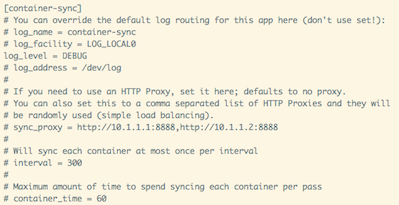 To add the container_sync middleware to your proxy pipeline. It needs to be after any memcache middleware and before any auth middleware. Configure container-sync in /etc/swift/container-server/1.conf on all SwiftStack Nodes running container servers in Cluster1. 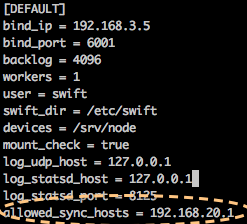 /etc/swift/container-server/1.conf on all Nodes running container servers in Cluster1. * Retrieve the account URI of c2con on Cluster2. 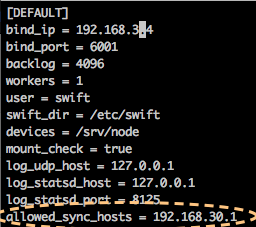 Configure container-sync in /etc/swift/container-server/1.conf on all Nodes running container servers in Cluster2. If you don’t want to setup Two-Way sync, please skip this step. running container servers in Cluster2. * Retrieve the account URI of c1con on Cluster1. # For One-Way sync, the secret key on c2con is enough. The swift-container-sync daemons will perform the sync periodically. You can upload some objects into c1con on Cluster1. Wait 5 minutes and check the container c2con on Cluster2 for updates. 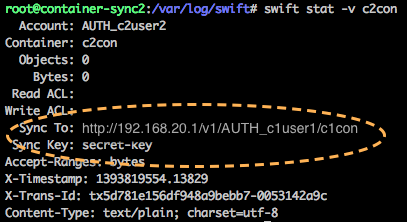 Also, you can find the PUT logs in /var/log/swift/proxy_access.log in Cluster2. [Important] Those PUT requests are issued by the container server on Cluster1. 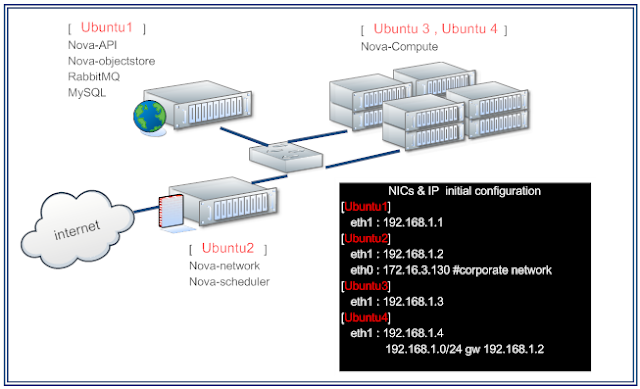 So, the Cluster2 API IP must be reachable by the container servers (nodes) on Cluster1. If you don't want to wait for 5 minutes, you can stop the container-sync worker and execute the worker on Cluster1.